The team at Quality Internet Solutions Ltd wanted to create some compelling statistical data for the Retail Sector, and opted to discuss Retail Outlets. In early 2014 B&Q, a UK home and garden company, created an innovative internal and external infrastructure for there organisation, of which cost in excess of £60 Million pounds. On the face of it, it appeared to the untrained eye, that the £60 Million pound price tag was just for a new website. If this was the case, this would have been in the Guiness Book of records for the most expensive website design ever completed. Most E-commerce specialists were astounded by the cost of such as project, however there were additional constraints to the IT framework, that most people had omitted to take into account. One such element was the “Live” stock system, which needed to work seamlessly between the website, its databases and more importantly the stock and till systems of each and every stock and warehouse. If you browse through the website sitemap here, you can see the rough overview of the main product categories. As with most Retail and Wholesale operations, the sheer volume of data streams makes the implementation of a new system very difficult, especially with a live business that has existing systems to maintain and operate. The feasibility study alone on this project would have been extremely complex, with various inherited data conversion issues, that would have tested the brightest of IT Professionals at MIT. 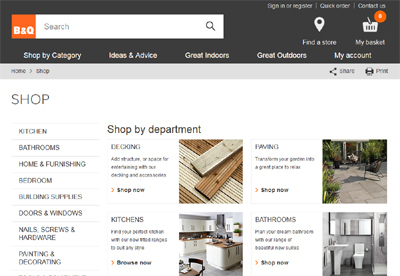 There are new websites such as Hadley Rose that have been developed in a similar way to the B&Q website, without the need to implement the data into an existing framework. This type of website was simpler, cleaner and far more cost effective, due to its infancy in terms of existing brand. As with most newly created and branded websites in 2017, they do have the advantage of a clean start, with no inherited internal systems and also no search engine marketing issues externally. The layout and structure of the Hadley Rose website is both simplistic and effective for the user, making it very easy to shop within the website. In addition there is also the website sitemap that is very well laid out and reflects a very similar structure to that of the B&Q website. 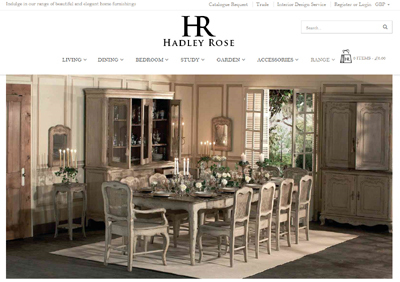 Whilst penetrating the retail sector in the “Furniture” sector is not an easy task, Hadley Rose have the fantastic advantage of only stocking bespoke and beautiful items. These types of luxury purchases are very often sought after within the wealthiest consumers, as well as anyone that appreciates well built quality items.